Torah Study at Bat Yam Temple of the Islands. Rabbi Stephen Fuchs speaking at Temple Shalom in Naples, FL. Rabbi Fuchs speaking on "Prisoners of Hope." 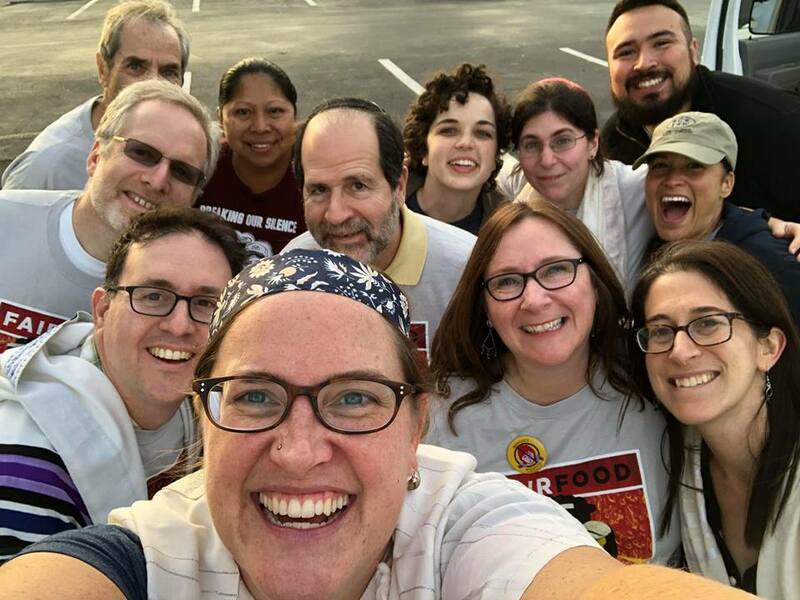 Rabbi Fuchs ready to protest with #TomatoRabbis at WENDY'S for their unwillingness to sign on to The Fair Food Act to guarantee Immokalee tomato pickers a living wage and safe working conditions . All other fast food outlets have taken this basic step for justice! ​Protesting in Naples, FL yesterday against Wendy’s unwillingness to buy Fair Food tomatoes UNLIKE McDonald’s, Burger King, Taco Bell, Trader Joe’s, Whole Foods and every other national, fast food outlet who do support the Fair Food program. Unfortunately PUBLIX also does not yet subscribe to the Fair Food program that guarantees better wages, safe working conditions and other important basic worker rights. If you shop at Publix, please ask the Manager why, and if the answer does not satisfy you, please make that clear to him or her. Hey, Wendy’s, shame on you! Farmworkers are people too! — with Justin David, Lupe Gonzalo, Bill Plevan, Kerry Olitzky, RabbiRobin Sparr, Cantor Vera Broekhuysen, Uriel Zelaya-Perez, IL Roque González and Rachel Kahn-Troster at Wendy's. To read the rabbi's speech, please click here. To watch the video, click here. Rabbi Fuch's convocation begins around the 10-minute mark. Rabbi Fuchs Goes to Jerusalem! 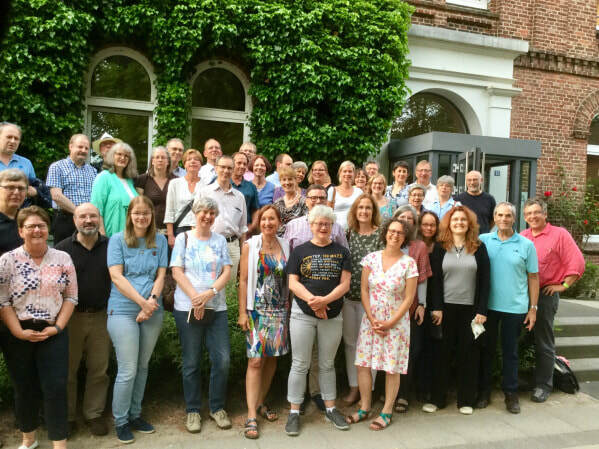 On Saturday morning, October 13, we will welcome to our congregation our dear friends from the Lutheran Church of Schleswig-Flensburg in Northern Germany. 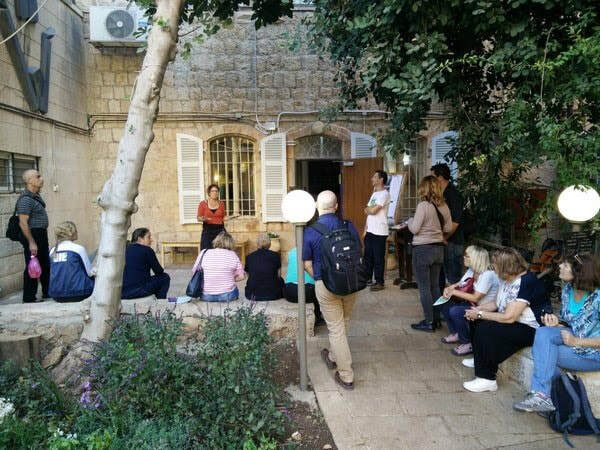 This will be the second year that our congregation at Kehilat Har-El will participate in the citywide “Batim Mibifnim – Open House” program. During it, we will open our gates to the general public next week on Thursday, October 18 from 5-8 PM and on Saturday, October 20 from 2-5 PM. A short explanation will be given about the history of our building through present times, including a visit to the original boiler room from the end of the 19th century. On Thursday, October 11, Zahra Culiolis Levy from Germany was called to the Torah as a bat mitzvah at the Egalitarian Section of the Kotel. Mazal tov to her and her family! This Friday evening, October 12, Har-El overseas member Rabbi Stephen Fuchs from the USA will deliver the sermon in Hebrew. In addition, our cantorial intern, Agnes Baroll will participate in the service. Rabbi Ada and Cantor Evan will officiate. Soon-to-be-Rabbi Leo Fuchs with proud father, Rabbi Stephen Fuchs in Jerusalem, Israel. Pastorin Ulrike Wolfhahrt and Rabbi Fuchs after his sermon at the Bonhoefferkirche in 2015. 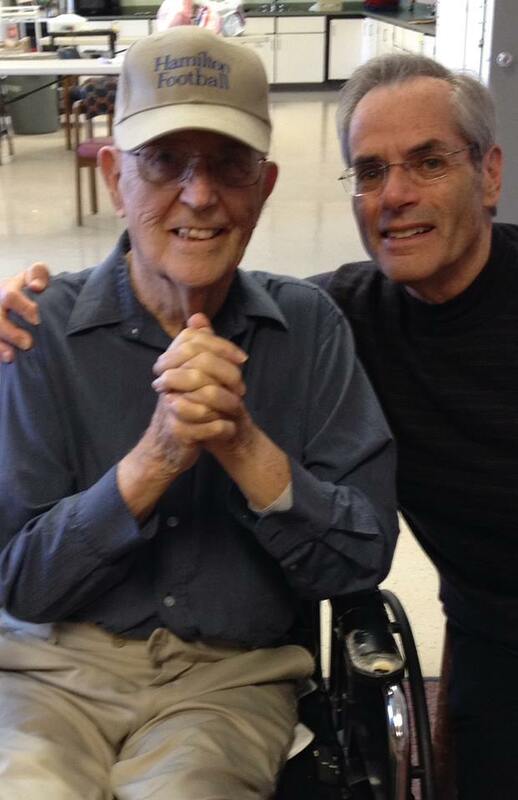 Read the charming story that accompanies this photo on the rabbi's blog by clicking here. 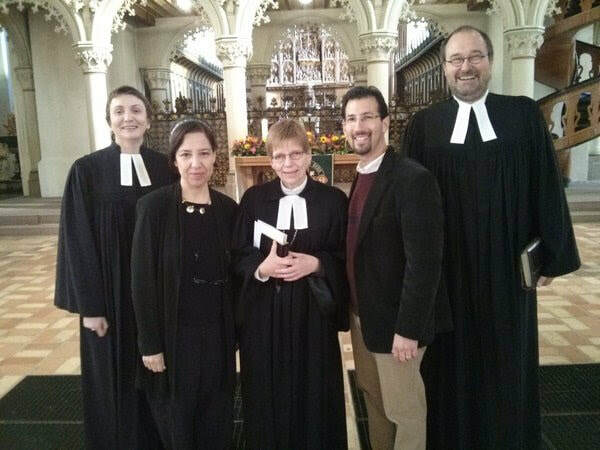 It was a joyful day in Brokstedt that Sunday, when Rabbi Fuchs had the privilege to take part in the installation service of Pastorin Ulrike Wolfhahrt. To her left is her husband, Pastor Alexander Wolfhahrt and to my right is the Propst, Dr. Kurt Rieke. 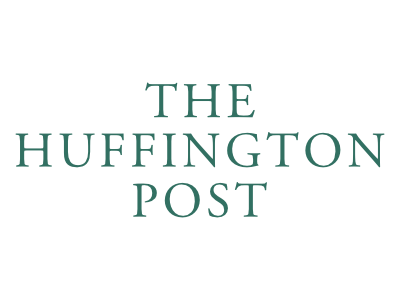 Rabbi Stephen Fuchs in the News! 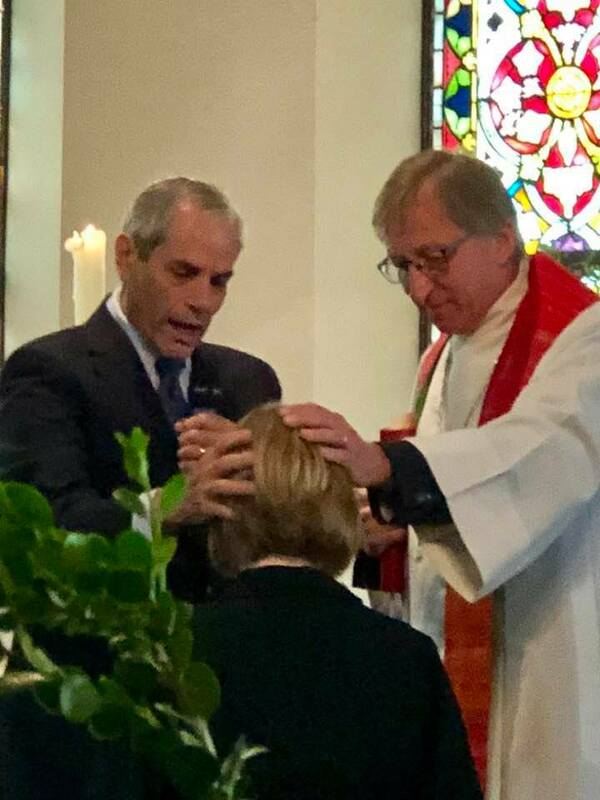 Rabbi Fuchs was humbled and honored to be invited by Pastorin Ulrike Wolfhärt and the area-wide Probst, Dr. Kurt Rieke to share some thoughts and offer a blessing to Ulrike at her installation as Pastor of the Lutheran Evangelical Church in Brokstedt, Germany this past Sunday. This is a new exhibit about Stefanie Steinberg's (Vickie's mother) life, put together by high school teacher Wolfgang Henke. It is based on the exhibit he and his class worked on with Pastorin Ursula Sieg four years ago. The purpose of the meeting was to express support and appreciation for the Rabbi and Vickie's work and to explore ways to expand it. 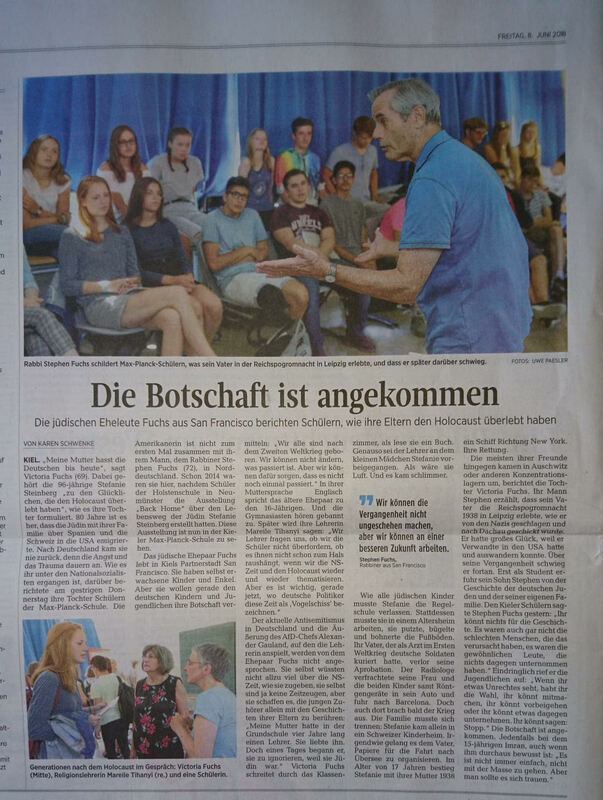 This article appeared today, June 8, 2017 in the Kiel daily paper about the lessons Vickie and Rabbi Fuchs taught yesterday to tenth graders at the Max Planck Schule. Rabbi Fuchs giving a sermon at the Thomas Church in Schulensee, Germany. The topic was "Pentecost and Shavuot: What Happened at Mount Sinai." Here we have a huge tree in Hamburg, Germany. The two people in front of it are Rabbi Fuchs and Yancy Sol Velasquez Levy, who translated "What's in it For Me?" into Spanish. Vickie Fuchs in London at Kenwood surrounded by 30 ft. tall rhododendrons. 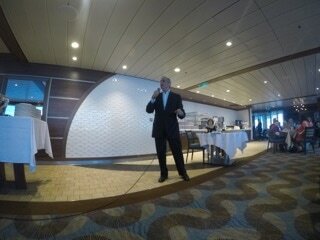 Rabbi Fuchs is making a point at his speaking engagement. 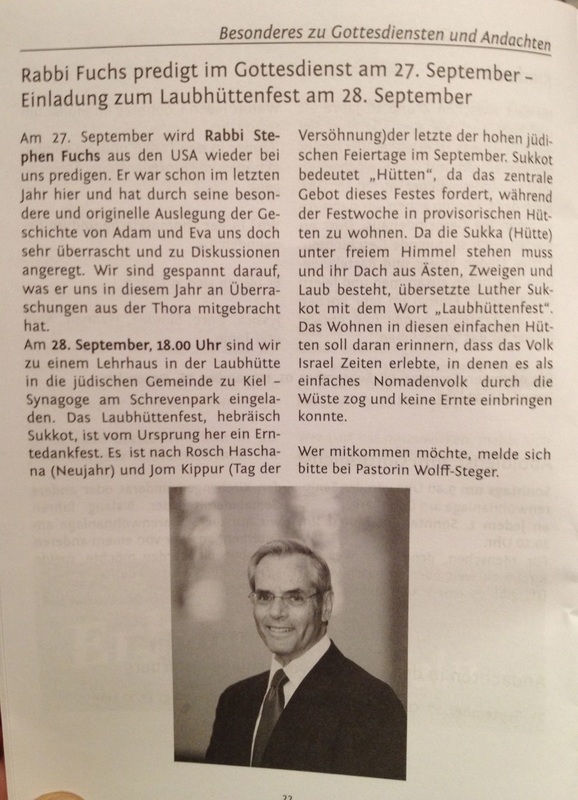 Announcing Rabbi Fuchs' speaking engagement in the Brokstedt district of Steinburg, in Schleswig-Holstein, Germany. Rabbi Fuchs addressing the Regional Convention for Lutheran Pastors on the concert of “Memory” in Jewish thought and to connect those ideas to Jewish Theology after Auschwitz. Rabbi Stephen Fuchs giving his third sermon at the Friedrichsstadt Synagogue. 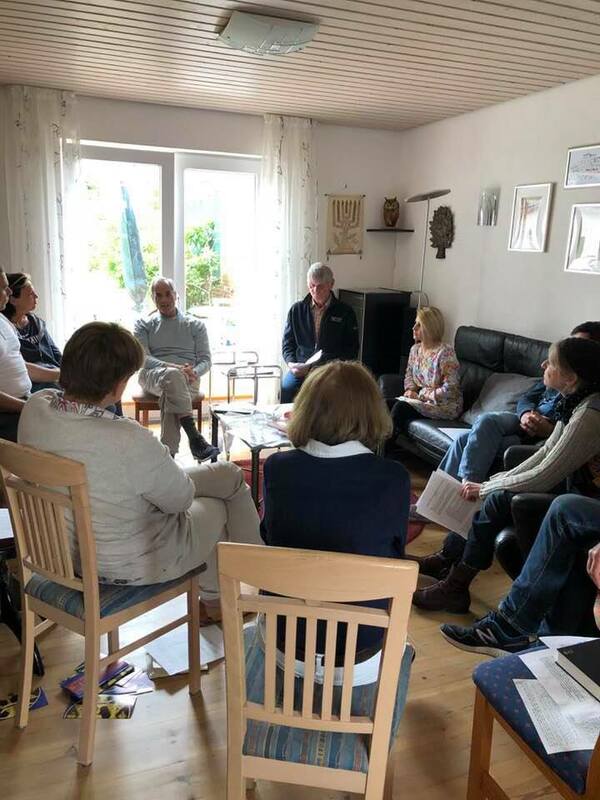 Rabbi Fuchs leading Shavuot Torah Study at Husum, Germany. I am proud to be one of the few people Mr. Adams recruited to Hamilton twice. Although I long ago reached the age where it was appropriate for me to call him Gil, it is a mark of my reverence for the man that he will always be Mr. Adams to me. Mr. Adams coached East Orange High School’s first varsity hockey team when I was a sophomore. Mr. Adams coached his heart out, and we played as hard as we could. Unfortunately, as hard as we could play resulted in an 0-15 and 1 season. That one tie against Morris Hills Regional High, something of a powerhouse team in our league, remains a precious memory. After my sophomore year, Mr. Adams left East Orange for West Essex Regional High School where he coached their hockey team to the state championship. I was in the stands for the final game against highly favored Chatham High. When the final buzzer sounded, Mr. Adams’ smile was as big as the sky. But his first gesture was not to celebrate but to seek out and shake the hand of the opposing coach and then to console and congratulate Chatham’s star player, Leroy Brennan, on an outstanding game. Although Mr. Adams left EOHS after my sophomore year, he maintained — and I honestly do not know why — an interest in me. In the fall of my senior year, he called to invite me to join him on a trip to visit “a very good college” where he would arrange for me to have an admissions interview. And so Mr. Adams drove me to Hamilton where I had an interview, saw a football game, and slept in the TKE House — Mr. Adams old fraternity. Mr. Adams traveled to the Hill to have a long heart-to-heart with another of his East Orange protégées, Tyrone Brown. Ty was “Mr. Everything” at EOHS, but after three years, he was considering dropping out of Hamilton. Mr. Adams was there to tell him — in no uncertain terms— that it was not a good idea. Mr. Adams must have been tired from being up all night talking to Ty because he actually allowed me to drive his car for a short part of the journey home. It was the first time I had ever driven a stick shift, and boy, did he wake up quickly when I took the wheel. When he learned I had made the final of the NCAA regional College Tennis tournament my senior year, he made the six-hour drive to Rider College in Trenton, New Jersey to see me play. In all my years of schooling — at Hamilton, through five subsequent years and four summers of rabbinical studies and four additional part time years at Vanderbilt for my D. Min. degree, I had never learned a more important lesson. At the time I graduated Hamilton — unlike today, I am happy to say — there were no Jewish studies courses or any other Jewish programming on campus. So when I began my rabbinical studies I had almost no Hebrew training, and many of my classmates were well advanced in their knowledge of the language. Bridging that gap was the greatest academic challenge I have faced. When I thought I couldn’t make it, Mr. Adams’ words came back to me. There are no excuses. Just work as hard as you can and live with the results. Thank you, Mr. Adams, for that crucial lesson. Six years later in 1959 “Junie” Walker died tragically. At the funeral, Mr. Adams told me, “even though just a few years before, Junie Walker was the ‘Toast of East Orange,’ I was embarrassed that I was the only white person there. After all he did for our city, it just seemed like the right thing to do.” What an impression that left on me! For many years now, Mr. Adams has missed the Mickey he fell in love with when she was a student at Rochester and he studied here. It is eight years since she died, but she was ill for many years before that. Through all of those years, Mr. Adams devotion to and concern for her care never flagged. I wish I had proof that it was so, but I know that as Dr. Seuss once wrote, “It should be it should be it should be that way.” Mr. Adams deserves nothing less. He deserves nothing less than the richest reward God can bestow. His memory will always be a blessing to me and to all of us who knew him. 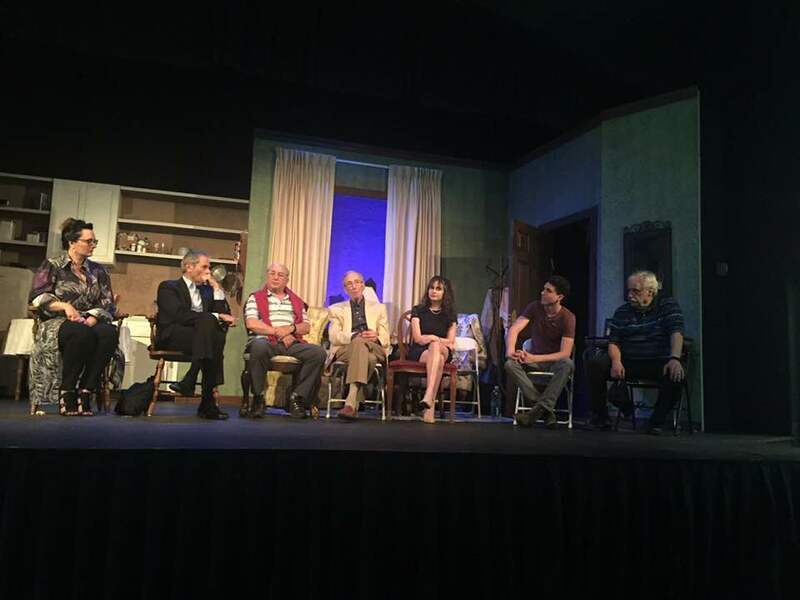 In honor of Holocaust Remembrance, Laboratory Theater hosted a community talk back after the performance of Visiting Mr. Green. This group included Rabbi Stephen Fuchs, WWII liberator Robert Hilliard, Cesare Frustaci, a Holocaust survivor and Wolfgang Vogel, a member of the Hitler youth. This group of brave men shared their stories and answered questions. It was not an easy discussion but a powerful one. For there to be healing the hurt, anger, sadness and honesty must be exposed and shared. As Rabbi Stephen Fuchs said “We can never forget but we must move forward from the pain and the lessons”. Thank you gentlemen and to those who came and listened. We are all on this journey of learning, healing and growing together. 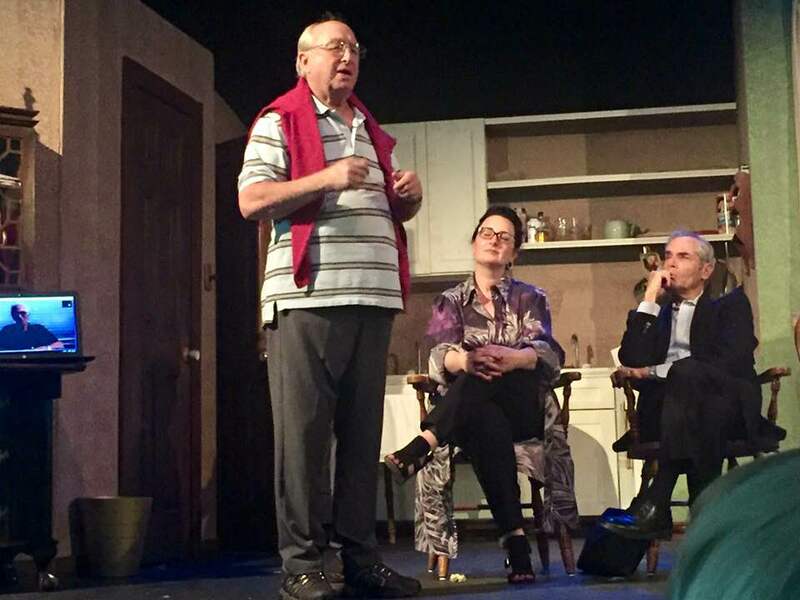 Holocaust survivor Cesare Frustaci speaks with the patrons at Laboratory Theater about being forced to fend for himself as a young child before his capture in Nazi controlled Hungary, Cesare was part of a panel of guests speakers highlighting the dangers of bigotry and intolerance. On January 18, 2017, Rabbi Stephen Fuchs donned his activist kipah (so to speak) and joined protestors at the Wendy’s restaurant on Hwy. 41 in Fort Myers, FL. The protest was in support of Immokalee Farm Workers asking Wendy’s to join other major food chains to support the Fair Food Practices agreement. Hopefully, the presence of the demonstrators registered with the thousands of cars that passed by on the busy highway. A small delegation went to speak with the store Manager, who listened with empathy. We pray she will communicate our plea to those who make Wendy’s purchasing decisions. Until they comply, we will eat elsewhere. 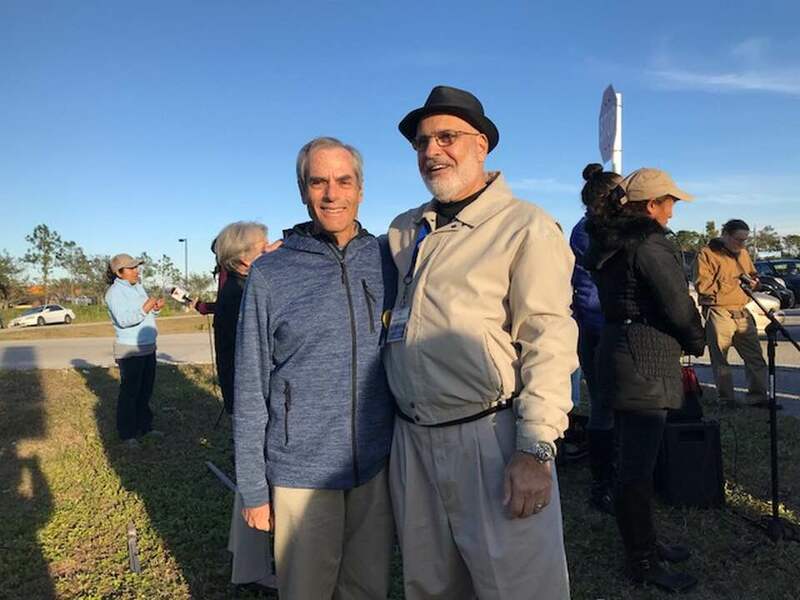 Rabbi Stephen Fuchs with Imam Mohamed al-Darsani and many others from all walks of life at protest rally on behalf of Immokalee Farm Workers and against Wendy’s. In Fort Myers, FL, Wendy’s is the only major food outlet to refuse to sign-on to the Fair Food Program that would raise wages for farm workers and increase their safety. Instead, Wendy’s opts to save a penny a pound on their tomatoes by buying them from Mexico. Photo courtesy of Sandy Teger. Here we have yet another news article featuring our favorite rabbi! This piece was written by Sandy Teger and appeared in the Sanibel-Captiva Islander on December 13, 2017. ​Several months ago, I spotted an announcement in this paper that Stephen Fuchs was coming to Sanibel as the new Rabbi for Temple Bat Yam. 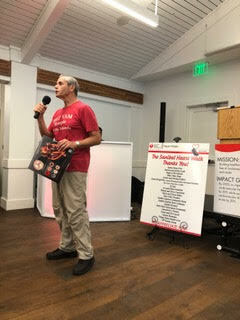 I decided to email him about this year's Sanibel/Captiva Heart Walk since Bat Yam has had a team walking every year. I expected a polite response; I did not expect to find someone who had two heart surgeries, would so generously share his experiences and agree to be the featured survivor at this year's Heart Walk. Rabbi Fuchs' story started in Nashville, where he served a congregation after earning his doctor of ministry degree from Vanderbilt University Divinity School. In a routine checkup by his internist, the doctor detected an abnormal murmur and sent him to a cardiologist for an echocardiogram. He was diagnosed with aortic stenosis, a progressive condition that would eventually result in the need for open heart surgery. It wasn't urgent since had no symptoms. The question was how long to wait. Fuchs knew that as people age other physical conditions may arise, eventually making the surgery riskier. Several years later, he and his cardiologist decided it was time and scheduled the surgery for July 1, 1996. The date was chosen to give time to recuperate before he was to officiate at his niece's wedding and for the High Holy Days in September. His surgery was successful, but after 10 days at home he seemed to be regressing. His wife Vickie took him to see the cardiologist at the hospital and after a 5-minute exam they zipped him up to the operating room to treat pericardial effusion (fluid around his heart). The reality hit hard; despite his planning he was not going to be ready in time for his niece's wedding. Although he had a mechanical heart valve and was taking Coumadin, he eventually recuperated and returned happily to his sports passion: tennis. A year later Stephen and Vickie Fuchs moved to Connecticut to lead a new congregation. His new doctors monitored him closely, doing an echocardiogram every four to six months. After 14 years with the West Hartford congregation he was ready to see more of the world. He became president of the World Union for Progressive Judaism and travelled for 18-months. During that time he made 65 visits on five continents and lived both in Israel and in New York City. In 2012, his cardiologist became concerned about his mechanical heart valve and also discovered an aneurism. Rabbi Fuchs learned that repairing an aneurism and replacing a valve during the same operation was not routine. He and Vickie did extensive research and they decided on a specific surgeon at Cleveland Clinic. After he had scheduled his surgery life threw another monkey wrench into his plans. Fuchs parted ways with his employer - not a positive prelude to heart surgery. After heart surgery depression is very common. Questions like "what should I do with the rest of my life?" have a new urgency. The period that followed Fuchs surgery was difficult, but the enforced quiet time made space for Fuchs to finish the book he'd had in his head for 40 years. During his time in Cleveland, Rabbi Fuchs became an active Facebook user and discovered how meaningful words of encouragement from friends and former acquaintances can be. Through coincidental connections Rabbi Fuchs and Vickie ended up going to Milan and Germany for the next few years. Germany was a strange place for two people whose parents had suffered at the hands of the Nazis, but led to some fulfilling experiences. 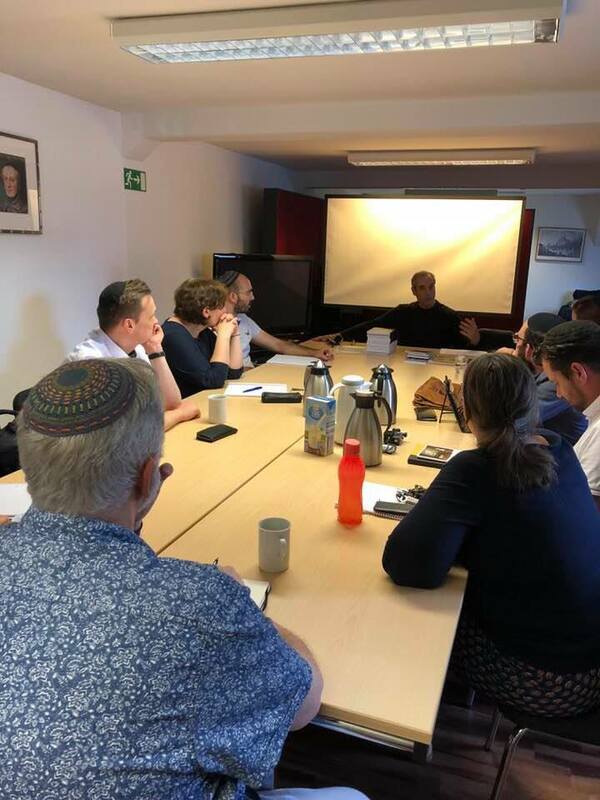 Fuchs spoke in more than 20 churches where a rabbi had never spoken before and where many of the worshippers had never seen a living, breathing Jew. Fuchs speaks of this period as providing "divine interventions" in his life and path forward. It was pure serendipity that led Rabbi Fuchs to learn of and accept the position as Rabbi at Temple Bat Yam. How many times do you get to consider a position based in Sanibel that involves a commitment only from September through April? The people of Sanibel are fortunate to have him here to exemplify his message, that the essence of Jewish values are found in concrete acts of caring and kindness that make a difference in the lives of others. Please join Rabbi Fuchs and Vickie for the fifth annual Heart Walk. It takes place on Sunday, Jan. 28, 2018. Festivities for the walk begin at 2 p.m. and the non-competitive, family-friendly walk begins at 3 p.m. at Sanibel Community House, 2173 Periwinkle Way. Walkers enjoy a safe, closed loop, and may do as many as laps as they wish to complete a 3.2-mile 5K or optional one-mile course. The Sanibel/Captiva Trust Company and Il Cielo are once again the Platinum Sponsors for the walk. To join a team or donate please visit www.SanibelCaptivaHeartWalk.org . If you are interested in becoming one of our sponsors or for further information regarding the walk, please contact Lee Heart Walk Director Kelly Glewa at (239) 340-2407 or Sandy Teger (973) 420-3233. The social media hashtag for the walk is #sancapheartwalk. 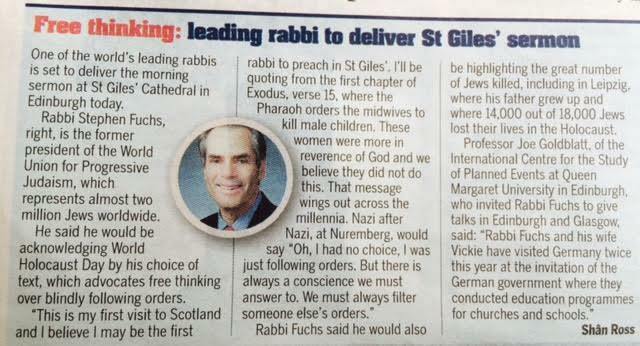 Our very own Rabbi Stephen Lewis Fuchs has made the papers again! This article, written by Ella Nayor, appeared in the Fort Myers Florida Weekly on December 13, 2017. Sanibel Jewish community honors new rabbi"
Lights of many hues flickered, blinked and illuminated a recent drive on Sanibel during Luminary festivities. The streets were washed in golden light as paper bags with lit candles inside lined the curbs and exterior of Periwinkle Way. Along the way, islanders and visitors reveled in the festivities that included food, drink and merriment at local businesses. Luminary is a chance to bring the community together and ring in the holiday season. And this year seemed no exception; folks rode bikes adorned with blinking lights, and donned holiday frocks and ensembles. After weaving through the throngs of Luminary revelers, I turned into the parking lot of the Sanibel Congregational United Church of Christ on Periwinkle Way. I came to attend services at Bat Yam Temple of the Islands. The Jewish congregation holds its Friday night and other worship services inside the church. 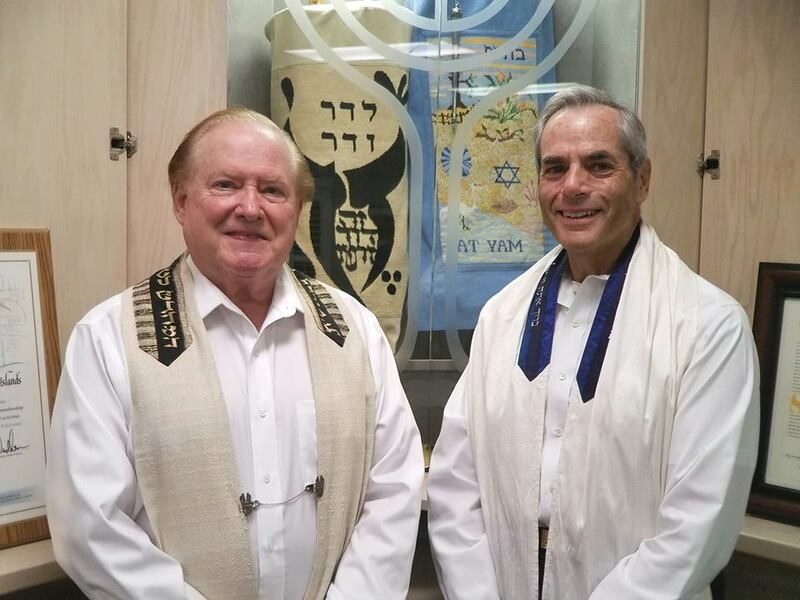 During a recent conversation with a religious leader in Fort Myers, I had learned that the nearly 30-year-old Jewish congregation recently welcomed a new rabbi and cantor. For those of you who are wondering, a cantor inspires and spiritually lifts the congregation with prayers put to song and music. Outside the church, it was dark and I wasn’t sure where to go. 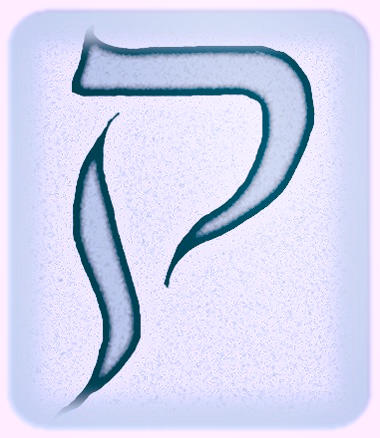 But then I heard the familiar chanting and soulful melody of a Hebrew prayer emanating from — yes — up above. I headed up the stairs and through a series of doors until I found myself inside the sanctuary of the temple. Services had begun. I promptly grabbed a nametag and prayer book and took a seat in the back. The congregants of Bat Yam Temple of the Islands seemed enraptured by their new spiritual leader Rabbi Stephen Fuchs. Rabbi Stephen spoke softly but with unwavering devotion and strength. The sermon reflected on the conflict and challenges between Biblical brothers Jacob and Esau. Basically the story goes that Jacob duped his and his older brother’s Esau’s sight-impaired father, Isaac, into giving Esau’s birthright to Jacob. As one could imagine, acrimony and hard feeling ensued and Jacob left home. Some time later the two brothers came back together and smoothed over their wounded egos. They overcame their differences and let compassion rule over ego. Rabbi Stephen related that this is relevant today in our everyday and global connecting. Rabbi Stephen is sort of a rock star in rabbinical circles — a progressive religious leader who has been a professor, lecturer, author and proponent of interfaith relations worldwide. He participated in the historic meeting of Pope John Paul II with other Jewish leaders in Miami and was chosen with 90 other leaders to attend a White House breakfast with former President Bill Clinton and former Vice President Al Gore. He also served as president of the World Union for Progressive Judaism. But even with a resume such as this, Rabbi Stephen showed himself to be humble, caring and accessible to his congregants. 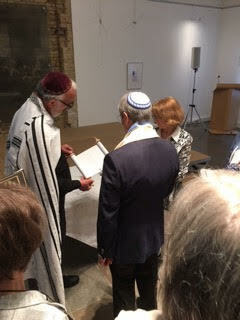 After services, the rabbi padded about the room and linked arms with members eager to share a little time with him. Cantor Murray Simon, also a star-studded figure in the Jewish religious world, joined him. Cantor Murray recently came out of retirement to perform cantoral services at Temple Bat Yam. The award-winning cantor received his master’s degree at the Boston Conservancy of Music and has been a featured tenor soloist at Lincoln Center in New York City. Rabbi Stephen and Cantor Murray shared with me how much they are enjoying island life and the congregants at Temple Bat Yam. Temple Bat Yam President Alan Lessick is thrilled with their new leader and the opportunities for growth and future programming that lie ahead. And, during the Oneg (a get together after Sabbath services), many of the members came up and shared how blessed they are to have their new spiritual leader. 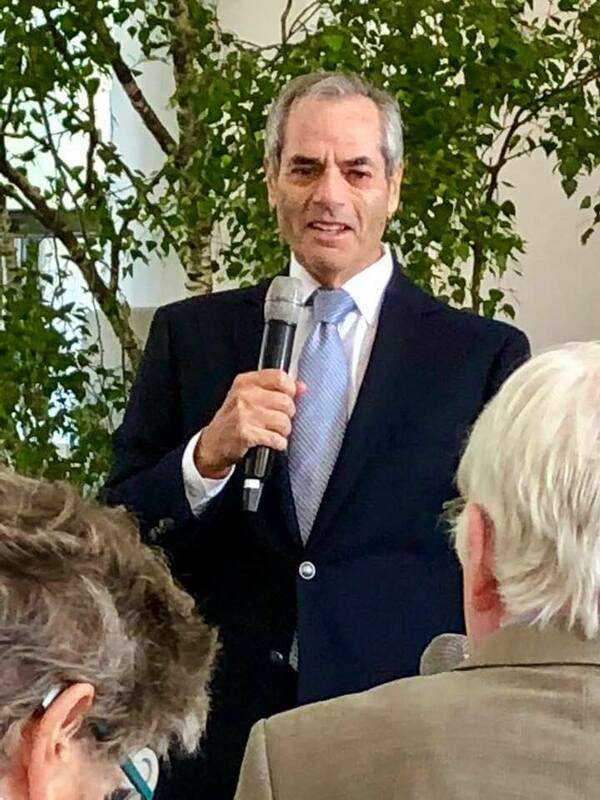 When there were a few moments to chat with Rabbi Stephen he shared with me his passion for speaking at churches in Germany and his work — written and spoken — to better connect leaders and followers of all faiths. He only started a few weeks ago, but since his inception, he has already met with Southwest Florida’s Interfaith Action Group and spoken at an IAG organized discussion. When I left services that evening and drove past the lights of Luminary glowing against the purplish night sky, I realized that light was shining throughout the entire island, even in the parts not strung up with bulbs, spotlights and candles. ​It seems that Rabbi Fuchs is having a difficult time with retirement. It's not that he hasn't tried, but things just don't seem to shake-out the way he plans. 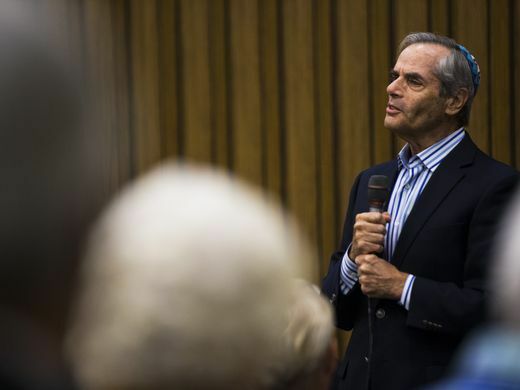 ​For instance, the first time he attempted to retire was in 2011, from Congregation Beth Israel in West Hartford, CT. At the age of 65, he decided it was time to spend more quality time with his family and maybe travel a bit. Little did the rabbi know that the World Union for Progressive Judaism had their eye on him for the position of President. ​"The opportunity to represent Reform Jewish values and practice in 65 communities on five continents, which that position gave me, was priceless. Even though I did not come close to meeting the expectation the lay leaders of the organization had in terms of fund raising, I would not trade the experiences I had during those 18 months for anything." ​Rabbi Fuchs was devastated when he was asked to step-down as President of the WUPJ just weeks before a complicated heart surgery, but in light of the contacts made and opportunities that continue to present themselves are well-worth the temporary angst. 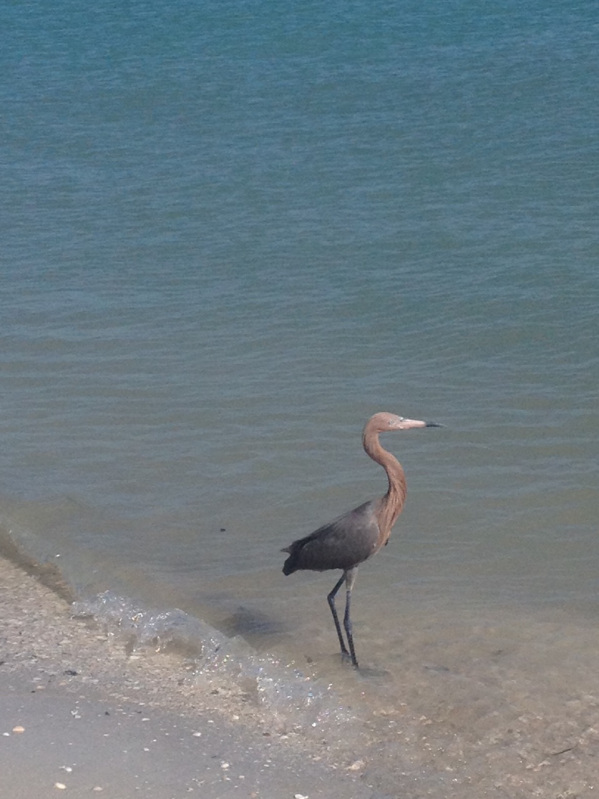 ​And then came Sanibel! You may glean the particulars by clicking here. 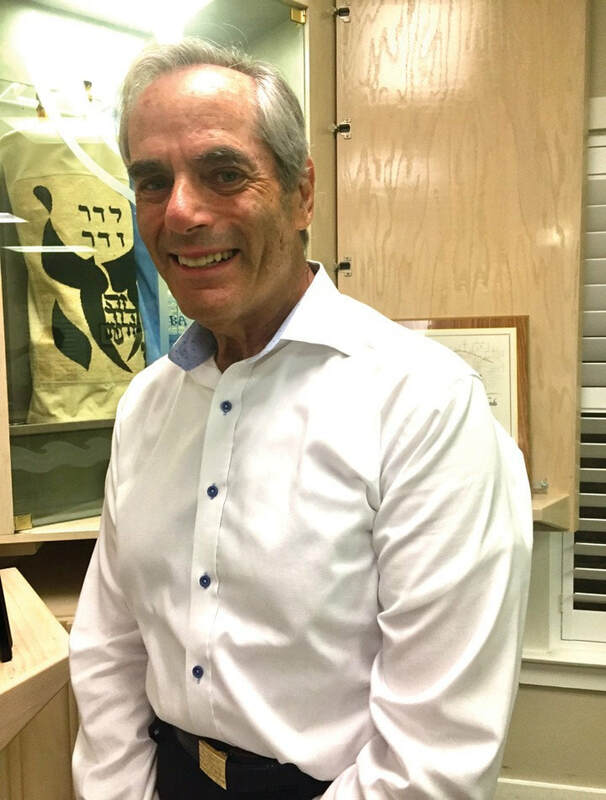 Rabbi Fuchs' installation will take place at 7:30 PM, January 5 (where Bat Yam Temple of the Islands meets) at Sanibel Congregational UCC, 2050 Periwinkle Way. In addition to Rabbi Paul Citrin of Albuquerque, NM -- the main speaker -- the Sanibel City Manager, Judith Zimomra; Jeanne Tobin, longtime friend of Rabbi and Mrs. Fuchs and former President of Temple Isaiah in Columbia, MD;​ Rev. Dr. John Danner of Sanibel Congregational UCC (where Bat Yam holds services) will each make short statements. Cantor Murray Simon, who will also be installed on January 5, and Rabbi Stephen Fuchs in front of the ark at Bat Yam Temple of the Islands. "Religious Leaders from Five Faiths Meet in Estero to Discuss Faith, Understanding"
At a time when the country remains divided on countless issues — from elections to whether football players should kneel during the national anthem — five faith leaders from different religious groups across Southwest Florida gathered in Estero Monday night to discuss collaboration. 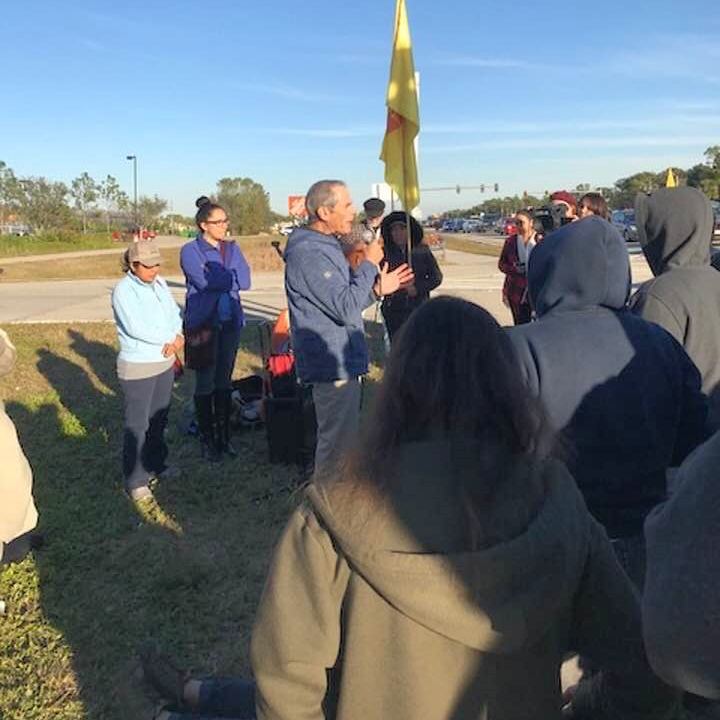 SWFL Justice4All Coalition partnered with Interfaith Action Group of Southwest Florida to organize Monday’s event at The Church of Jesus Christ of Latter-Day Saints on Three Oaks Parkway. 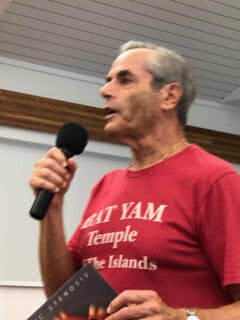 The interfaith discussion was a “Moral Monday Meetup,” a free public event held by the SWFL Justice4All Coalition to delve into social issues and explore opportunities for community activism. Representatives from Southwest Florida’s Jewish, Catholic, Mormon, Buddhist and Muslim faiths shared their visions for peace, respect and understanding in our world today. “One thing about interfaith work is it’s not about trying to convince someone else about what you believe, it is trying to understand better what they believe and working together towards a common purpose,” said the Rev. Tony Fisher, panel moderator and minister of the Unitarian Universalist Congregation of Greater Naples. The panel began with Mohamed al-Darsani, founder of the Islamic Center for Peace in Fort Myers, an organization with the mission of promoting education and community involvement. Al-Darsani, who helped plan the event, joined the panel to fill in for Hassan Shibly, executive director of the Council on American-Islamic Relations Florida. Shibly was called to Jacksonville after the Jacksonville Sheriff’s Office reported Monday that law enforcement prevented a mass shooting at the Islamic Center of Northeast Florida. Al-Darsani said that his interfaith community action was sparked by the Sept. 11 terrorist attacks. After 9/11, al-Darsani developed relationships with local faith leaders and began speaking in churches where he was invited to build bridges and share about Islam, he said. That kind of cooperation could help heal some of the division current divisiveness in the United States, al-Darsani said. Rabbi Stephen Fuchs, of Temple Bat Yam in Sanibel, built on al-Dasarni’s words. Fuchs said that a phonograph record he received from his mother when he was five years old, first taught him the value of diversity. Some of the songs declared skin color was of no consequence, he said. He remembers those simple lessons from that record today when he preaches about respect and understanding, Fuchs said. “Diversity is a positive and wonderful value, and if we are to respect and embrace and affirm diversity — not just tolerate it — then I think one of the most important things we need to do is learn not just to share our views, but to listen, really listen to those of the other,” Fuchs said. Under the Buddhist teachings, said Mary Tracy Sigman, Dharma leader of the Rissho Kosei-Kai Buddhist Group of Fort Myers, when our body dies we are left with an eternal essence of goodness and love. After the panel, audience members and panelists mingled, discussing the topics from the evening. 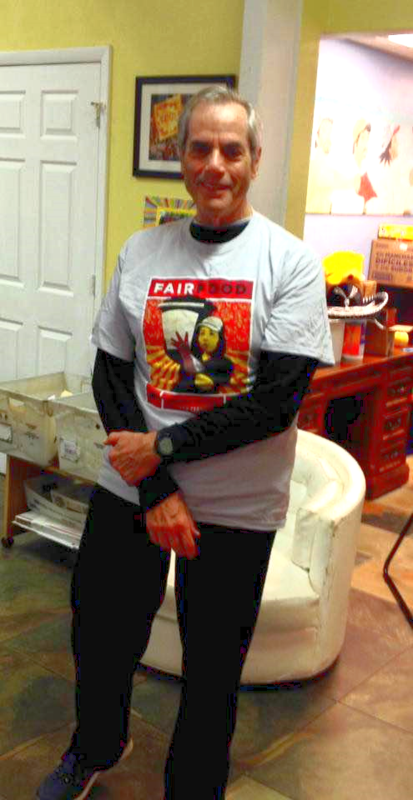 Sara McFadden, a Naples resident and member of the SWFL Justice4All Coalition and the Unitarian Universalist Congregation of Greater Naples, said faiths based on love will be what brings people together. 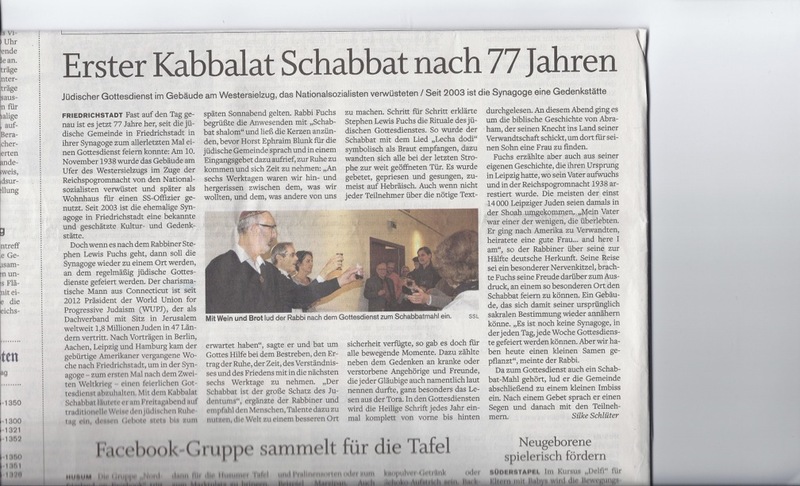 ​Rabbi Fuchs had the privilege of conducting the first Jewish service in the city of Friedrichstadt in 77 years. ​Fast auf den Tag genau ist es jetzt 77 Jahre her, seit die jüdische Gemeinde in Friedrichstadt in ihrer Synagoge zum allerletzten Mal einen Gottesdienst feiern konnte: Am 10. November 1938 wurde das Gebäude am Ufer des Westersielzugs im Zuge der Reichspogromnacht von den Nationalsozialisten verwüstet und später als Wohnhaus für einen SS-Offizier genutzt. Seit 2003 ist die ehemalige Synagoge in Friedrichstadt eine bekannte und geschätzte Kultur- und Gedenkstätte. oder verstorbene Angehörige und Freunde, die jeder Gläubige auch namentlich laut nennen durfte, ganz besonders das Lesen aus der Tora. In den Gottesdiensten wird die Heilige Schrift jedes Jahr einmal komplett von vorne bis hinten durchgelesen. An diesem Abend ging es um die biblische Geschichte von Abraham, der seinen Knecht ins Land seiner Verwandtschaft schickt, um dort für seinen Sohn eine Frau zu finden. Gottesdienste gefeiert werden können. Aber wir haben heute einen kleinen Samen gepflanzt“, meinte der Rabbi. Da zum Gottesdienst auch ein Schabbat-Mahl gehört, lud er die Gemeinde abschließend zu einem kleinen Imbiss ein. Nach einem Gebet sprach er einen Segen und danach mit den Teilnehmern. Our very own Rabbi Stephen Fuchs has been invited to discuss the Jewish perspective the topic of violence committed in the name of Judaism. If you will be in the Fort Myers area tomorrow, please stop by the Unitarian Universalist Church to show your support. He'd love to see you! Birmingham, Alabama, September 8, 2017: In April, Rabbi Stephen Fuchs had been nominated, and in August he learned he been chosen as the recipient of the VDS Distinguished Alumnus Award. Yesterday, it became official. A celebration dinner will be held in Nashville on October 17, 2017 at the University Club of Nashville. To be considered for the school’s Distinguished Alumni/ae Award, one must demonstrate excellence and distinction in justice-making through their efforts in congregational ministry, religious institutions, non-denominational/all-inclusive organizations, community–based organizations, government, or other social institutions. Among his numerous accomplishments, Rabbi Fuchs was the first rabbi invited to speak in several churches in Germany, in addition to conducting the first Jewish service in the city of Friedrichstadt, Germany since Kristallnacht. He was also the first rabbi to give a sermon at St. Giles Church in Edinburgh, Scotland. As a writer and lecturer, Rabbi Fuchs’ focus is on social actions to inspire racial and religious affirmation, understanding, and respect. Stephen Fuchs is also Rabbi Emeritus of Congregation Beth Israel in West Hartford, CT, and former president of the World Union for Progressive Judaism (WUPJ). Later this month he will assume the pulpit at Bat Yam Temple of The Islands in Sanibel Island, Florida. 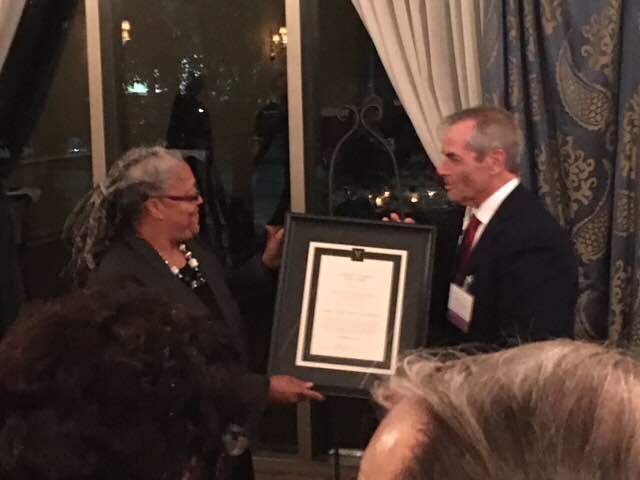 Receiving Vanderbilt Divinity School’s Distinguished Alumnus of the year for 2017 from Dean Emilie Townes. "...At that time, Reform-Progressive Rabbi Stephen Fuchs held the line for the Jewish people and was able to deliver a firm response that would put many of today’s younger Orthodox rabbis and Torah observant activists to complete shame. 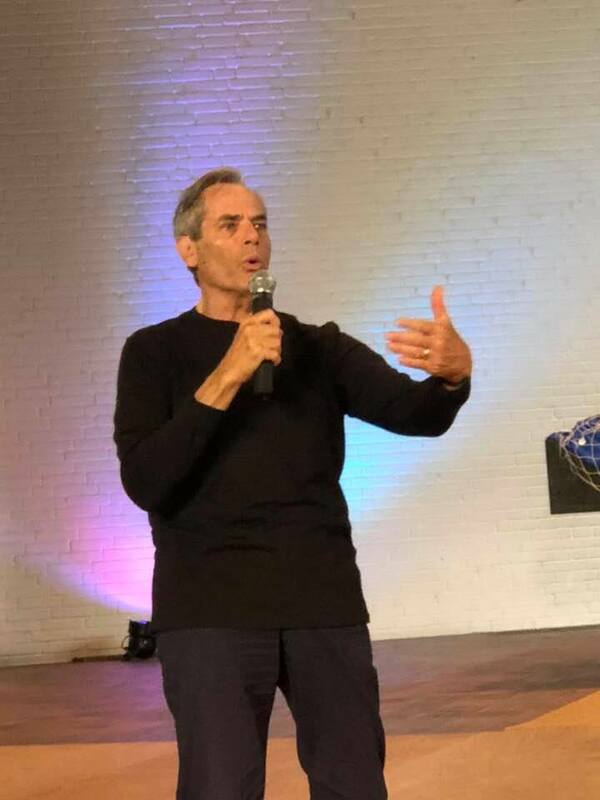 A good number of Jeremy Gimpel’s responses delivered to an audience two weeks ago at Fellowship Bible Chapel appear to be noncommittal, fawning and ambiguous at best. And, in the opinion of Jewish Israel, Gimpel’s “open-ended” approach to Jewish-Christian theological relations could actually encourage those looking forward to a missionary harvest." ​ We've finally chosen the winner of the "Name the Kof" contest! It wasn't as easy as it might seem, considering all the creative and sometimes 'off-the-wall' responses we received. Wow! We'd like to thank everyone who participated, and better luck next time. Who knows? Maybe we'll have another nameless Kof one day. Without further ado, the winner is Akuokuo Vallis, who blogs over at STROKE(d) with "Ceiling Tile Kof!" Is that a great name, or what? Most apropos! Akuokuo won a signed copy of Why the Kof? Getting the Best of Rabbi Fuchs, as well as a signed copy of Gutter Ball: A Collection of Short Stories by Susan Marie Shuman. Congratulations & way to go, Akuokuo! Akuokuo (pronounced Ah-kwo-kwo) makes her home in the northwest DC area, and launched her Stroke(d) blog as a vehicle by which to share the story of her mother's stroke recovery. She has an identical twin sister named Akwelle, which means first-born twin; Akuokuo means second-born. Had they been boys, their names would've been Romulus and Remus, as her father liked that story of the founders of Rome. She attended Brown University where she studied International Relations. Akuokuo's interests include cooking, painting, and photography. Future plans include having her own line of natural fragrances as well as a line of men's clothing. Click the Kof to view the slide show presentation of The Art of Kof. ​New designs are added weekly, so be sure to check back often! It gives me great pleasure to announce that Bat Yam has engaged a new rabbi. Stephen Lewis Fuchs comes to us from West Hartford, CT with a rich and varied background. His last pulpit was at Congregation Beth Israel, where he served as senior rabbi for 14 years before retiring in 2012. The following year, far from cutting back on rabbinic duties, he served as Interim Rabbi for Congregation Beth Shalom in Milan, Italy. He then spent 10 weeks each year from 2014 to 2016 in Germany where he conducted services for the Days of Awe, lectured and taught at the Abraham Geiger College in Berlin and preached/taught in more than 20 churches. His wife, Vickie joined him in teaching about the Shoah in local high schools. Previous pulpits as senior rabbi were The Temple (Congregation Ohabai Sholom, Nashville, TN for eleven years, and Temple Isaiah, Columbia, MD for 13 years. Note: He began is a Rabbinic Intern at this congregation and then was hired as the first full- time rabbi, helping it to grow from 58 to 385 families during his tenure. Rabbi Fuchs’ other accomplishments are almost too numerous to mention. He served as president of the World Union for Progressive Judaism, visiting over sixty-five communities on five continents speaking and teaching as well as advocating on behalf of Reform Jewish thinking and practice. He was adjunct professor at Hartford Seminary and Saint Joseph’s College, and he has lectured and/or taught at seminaries, colleges and organizations all over the country. In addition, Rabbi Fuchs has immersed himself in many organizations both Jewish, interfaith and communal. In each of these, he has served as a board member, committee chair or officer. He is the author of several books and over 390 published essays. I invite you to visit him on his website, www.rabbifuchs.com where you will find a wealth of information. Stephen and his warm and charming wife, Vickie are looking forward to joining the Bat Yam family in September. At his request, he will begin conducting services on Selichot and continue leading and teaching to the end of April. Now, I would like to express my heartfelt thanks to the board and our outstanding Search Committee chaired by Lois Lorsch and co-chair Bob Schoen. Committee members were Miriam Bailey, David Berger, Barry Epstein, Barry Fulmer, Michael Hochschild, Edina Lessack, Howard Lorsch, Barry Roth and Leon Skolnick. They made this process run smoothly and efficiently. Birmingham, Alabama, May 2, 2017: On May 8, 2017 at Congregation Beth Israel in West Hartford CT, Rabbi Stephen Fuchs will lead the Annual Interfaith Clergy Institute on Jews and Judaism. The topic, "Abraham: Spiritual Father of us All" explores the Biblical figure, Abraham, and how the narratives about him are also about us. The event is free of charge and will take place from 9:00am until 1:00pm at 701 Farmington Avenue, West Hartford, CT 06119. Lunch is included, during which there will be an opportunity for informal Q&A and reflection on the morning’s lectures. Lecture 1: “Why Abraham?” Why does God choose this individual to restructure our traditional lifestyle and introduce to us an innovative way in which to interact with the Creator. Lecture 2: “Finding Ourselves in The Abraham Stories.” What do the key Abraham narratives teach that can help each of us become better human beings and spiritual leaders? Rabbi Stephen Lewis Fuchs is the author of three books, the former President of the World Union for Progressive Judaism (WUPJ) and Rabbi Emeritus of Congregation Beth Israel in West Hartford. An alumnus of Vanderbilt University Divinity School, he earned a Doctor of Ministry Degree in Biblical Interpretation in 1992. "Abraham: Spiritual Father of us All"
SPRINGFIELD, NJ - Friday night, April 21, Temple Sha'arey Shalom of Springfield NJ commemorated Yom HaShoah. Rabbi Stephen Fuchs, our guest speaker, was mesmerizing, tying the text of the Torah portion with his father's own story as a Holocaust survivor and Rabbi Fuchs own experiences as a present day speaker in Germany. Rabbi Fuchs has educated smaller churches in Germany about the Shoah of which they had known Nothing. 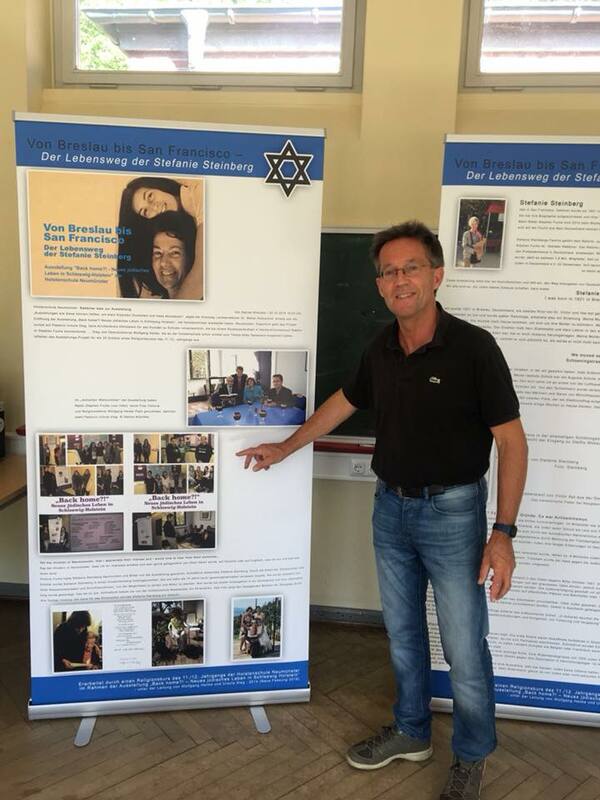 Currently he teaches high school students across Germany about their country's history. Please click here, to view the photo. Pictured are Pam Bain, Temple President; Cantor Amy Daniels; Rabbi Fuchs and Rabbi Renee Edelman. 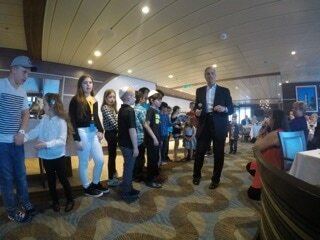 ​You may have noticed on our Contact/Calendar Page that Rabbi Stephen and Vickie Fuchs celebrated Passover on an Anthem of the Seas Cruise to the Bahamas. 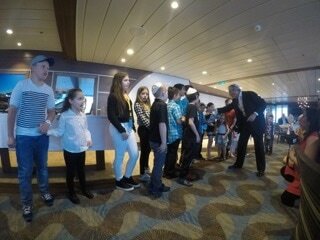 Rabbi Fuchs led the Passover Seder and conducted the Children's Choir. Rabbi Fuchs leading the Passover Seder. After consultation with Rabbi Fuchs, the Anthem of the Sea chefs took great care to see that each individual table had the ritual foods required for each person to participate actively in the Seder. The children asking "The Four Questions." Rabbi Stephen Fuchs is interviewed in the April issue of West Hartford Life. Click below to read now! "The Future is Ours to Shape"
Birmingham, Alabama, March 10, 2017: Susan Marie Shuman, the freelance writer and editor of SusanWritesPrecise is thrilled to announce the publication of Rabbi Stephen Fuchs’ third book, “Why the Kof? Getting the Best of Rabbi Fuchs.” Compiled and edited by Ms. Shuman, this new book comprises forty-seven of the rabbi’s finest (to date) essays and blog posts. Having worked with Rabbi Fuchs on previous projects, Ms. Shuman came to know his work well, and found the extensive subject matter though-provoking, refreshing, and insightful. 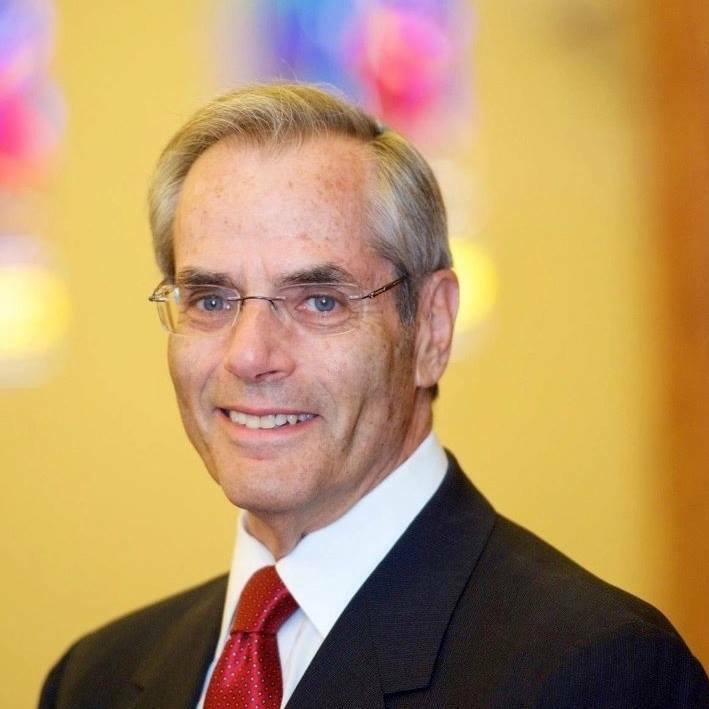 Rabbi Stephen Lewis Fuchs is the former President of the World Union for Progressive Judaism (WUPJ) and Rabbi Emeritus of Congregation Beth Israel in West Hartford. “Why the Kof? Getting the Best of Rabbi Fuchs,” will be available for purchase on 02/23/2017 from Amazon.com and the CreateSpace eStore in both paperback and Kindle formats. ​Friday, September 9 at 8:15 PM- The installation will take place during Shabbat Evening Services at . Rabbi Stephen Fuchs, Past President of World Union for Progressive Judaism (and Rabbi Cosnowsky's former Rabbi) will install Rabbi Cosnowsky into her new role. Rabbi Fuchs was very instrumental in leading Rabbi Cosnowsky into the rabbinate. Saturday, September 10 from 4:00 PM- 6:00 PM- Shabbaton Scholar Study Session led by Rabbi Stephen Fuchs. Free babysitting is available. Saturday, September 10 from 4:00 PM- 6:00 PM- Magic show for families with young children and siblings. A magician will entertain followed by snacks, art projects, and play time. Saturday, September 10 at 6:00 PM- Potluck Dinner and Sing a-long. 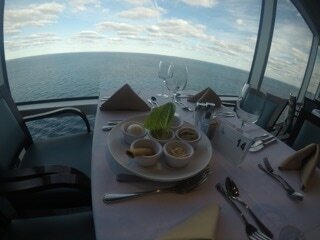 The main course and beverages will be provided. Attendees are asked to bring a salad, side dish, or dessert. 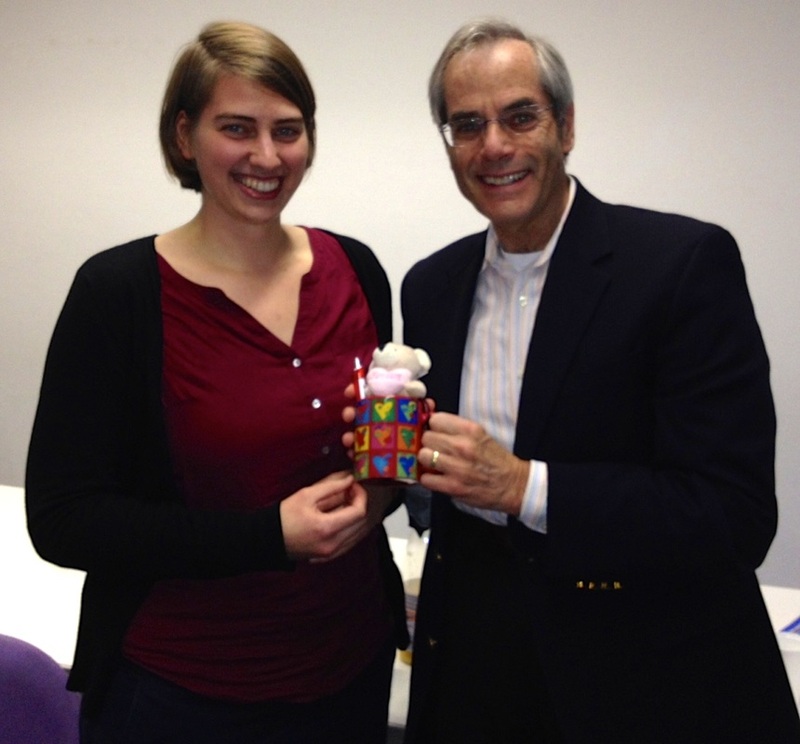 RIGHT: Receiving tokens of appreciation from the Youth Division Chair of the Jüdische-Christian Gemindschafte in Berlin, Mirjam Blumenschein. I conducted a two-hour discussion of What’s in It for Me? Finding Ourselves in Biblical Narratives at their annual gathering on November 13, 2015. 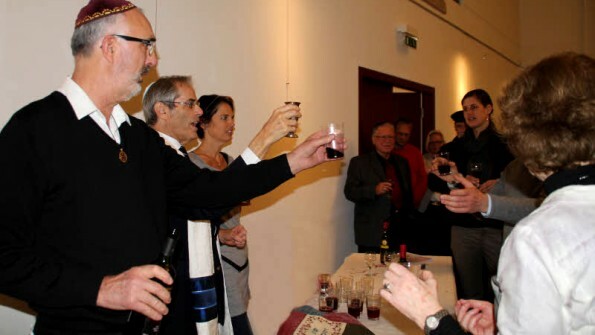 On Friday, November 6, 2015, Rabbi Fuchs was privileged to conduct the first Jewish service in Friedrichstadt, Germany since Kristallnacht, November 9, 1938. On that night the synagogue was taken over by the Nazis and subsequently used as the home for an SS officer. Today it is a Jewish cultural center and museum. 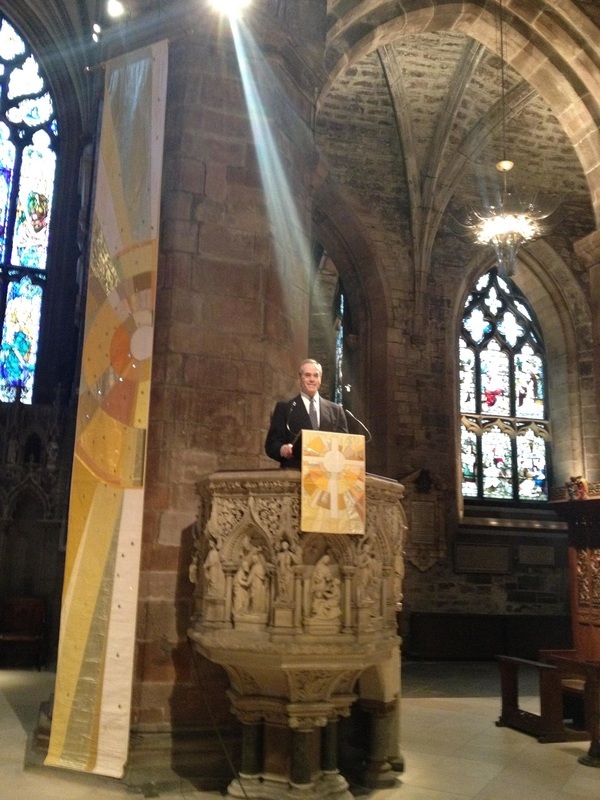 Below: Preaching at St. Giles Cathedral, Edinburgh, in remembrance of the Holocaust, January 31, 2016. 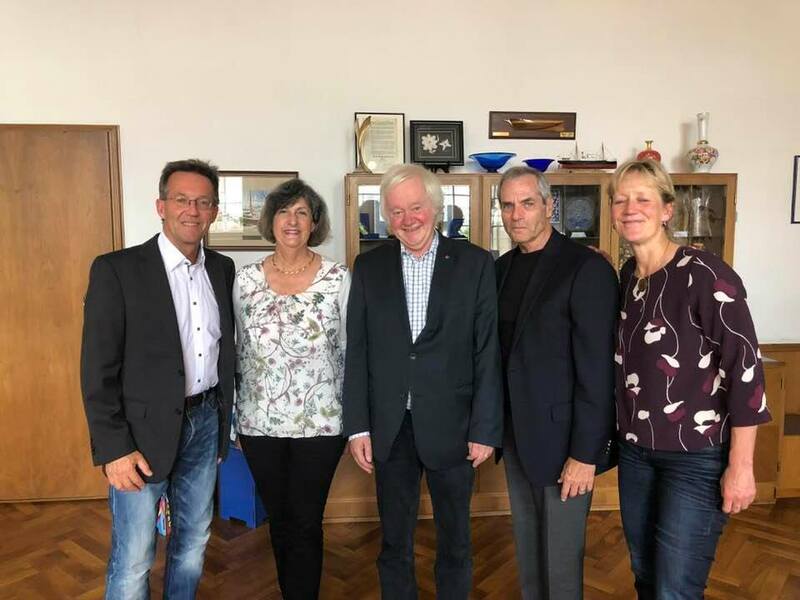 LEFT: Warm thanks to Pastorin Anke Wolff-Steger for inviting me to preach to her congregation, Thomaskirche in Schulensee about Sukkot and the Story of Creation. 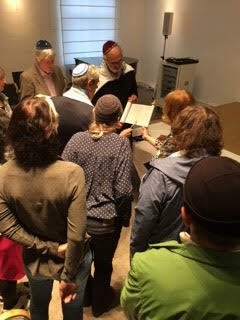 RIGHT: Enjoying discussion with Jews and Christians visiting the sukkah at the Jüdische Gemeinde in Kiel. Rabbi Fuchs being interviewed about What's in It for Me?, by Susan Campbell, an award-winning Hartford Courant columnist and author of Dating Jesus. The Greater Hartford Council of Churches sponsored the event. Rabbi Stephen Fuchs' interview with Rev. (Dr.) Shelly Best, President and CEO of the Conference of Churches of Greater Hartford. Rabbi Stephen Fuchs interviewed on “Main Street Vegan” with Victoria Moran. Conversation with Rabbi Stephen Fuchs: West Hartford rabbi shares the modern-day wisdom of Tor﻿ah stories WEST HARTFORD – The number 40 has deep significance in Jewish tradition. Noah endured 40 days of rain; Moses spent his first 40 ﻿years ﻿in the court of Pharaoh and the next 40 years leading the Jews from Egypt to Canaan; along the way, he spent 40 days with God on Mount Sinai. The Talmud teaches that at age 40, a person transitions from one level of wisdom to the next. The Good Boo﻿k: What's in It for Me? Rabbi Fuchs employs the biblical stories with wisdom, compassion and even humor to gently prod us along a path to better life. More than most contemporaries, he has grasped the essence of faith as a life affirming way to achieve social change. In bright, crisp, direct prose, Rabbi Fuchs shows how such belief may "make the world a better place." As he says, "The biblical narratives I elucidate relate to this central idea. 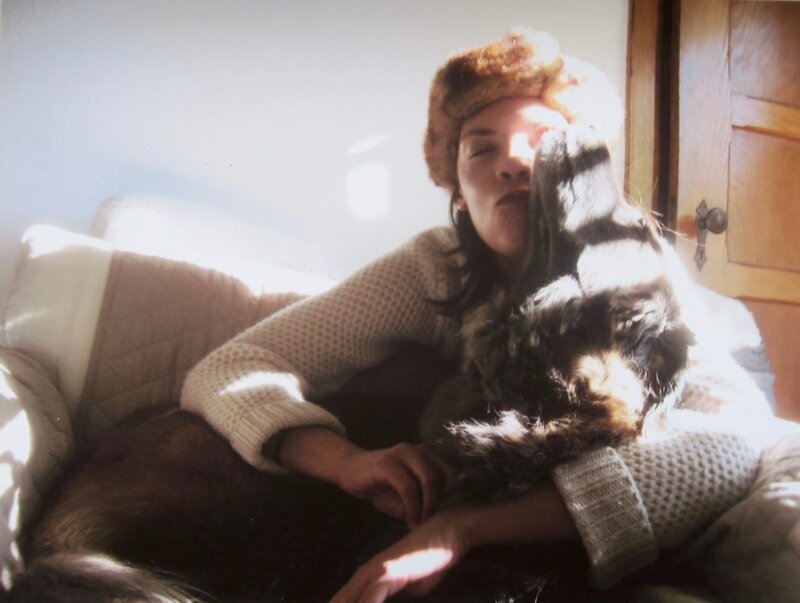 These narratives can enrich all of our lives whether we see ourselves as religious or not." The Burden of Being Israel By Rabbi Stephen FuchsOnce again the Mideast is in turmoil. Some even claim it is on the brink of war. Predictably, but sadly, much of the world is blaming Israel. (JTA) – Rabbi Stephen Fuchs has been named president of the World Union for Progressive Judaism. ​April 4, 2011--Rabbi Fuchs has served nearly four decades as a pulpit rabbi, including his present position as senior rabbi of Congregation Beth Israel in West Hartford, Conn., a job he has held since 1997. 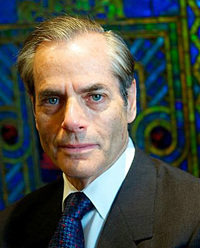 He is a past chair of the Central Conference of American Rabbis committee on inter-religious affairs, and is known for his work in Jewish-Christian relations and social justice issues. Fuchs will assume the presidency in July, and plans to divide his time equally between North America and Israel. The World Union is the international umbrella organization of more than 1,200 Reform, Liberal, Progressive and Reconstructionist congregations in 44 countries.